Yes. School board members around the country who actually SPEAK OUT FOR public education and meaningful and equitable education for ALL children are indeed like unicorns. But here in Howard County, Maryland we have at least one. And when they are “sighted” (like unicorns) we must celebrate their courage widely. But Bess Altwerger isn’t only a member of a school board. She is Professor Emerita at Towson University. She is a founding member of Save Our Schools, a current Steering Committee member, and was a key organizer of the summer 2011 Save Our Schools rally, march and conference in Washington, DC. She has worked with teachers on the Navajo reservation, in the barrios of NM and AZ, and in urban school districts in the northeast and mid-Atlantic states to support multicultural/multilingual, democratic and child-centered education. Bess has published and presented widely on the negative impact of federal policies on our schools and classrooms, particularly in the area of literacy. Her books include Reading for Profit: How the Bottom Line Leaves Kids Behind (2005). We need more BoE members who UNDERSTAND and will FIGHT FOR public education, children, educators, social justice and democracy. We need to stop handing over positions of power to corporate reformers no matter how much money they throw at inserting themselves into the educational landscape under the guise of “caring for schools” when it is clear they care for corporations more. Bess like so many others, fights for education underneath the radar where media remain silent and funding in non existent. Bess and many like her are the face of the education revolution. They are not here for the fame or the for profit. They are here for our children. And we must support them, because the dominant “reform” narrative which owns the think-tanks and mainstream media will do everything to stop us. And we will keep pushing forward. Before I vote on this budget, I want to express my appreciation to the Superintendent, my fellow board members, and especially the staff who put countless hours into preparing and revising this budget. My votes on the budget areas in no way reflect my lack of appreciation for all the many considerations and constraints that shaped the process of developing this budget. Beverly Davis went to extraordinary lengths in her effort to produce a budget that reflected the directions she was given. Thank you Bev and to the rest of the staff. I also want to thank the members of the Citizen’s OBRC who worked on their own to provide the Board very careful analyses of every area of the budget with recommendations for reallocation and revisions of the budget so as to ensure the people of Howard County that their tax dollars were being wisely spent to provide the best possible education for all of our students. Thank you for the time to express my views, and I apologize in advance to our dedicated staff who prepared each area of the budget to such painstaking detail and to the Supt and my Board colleagues who I know are doing what they think is in the best interest of the entire HCPSS. 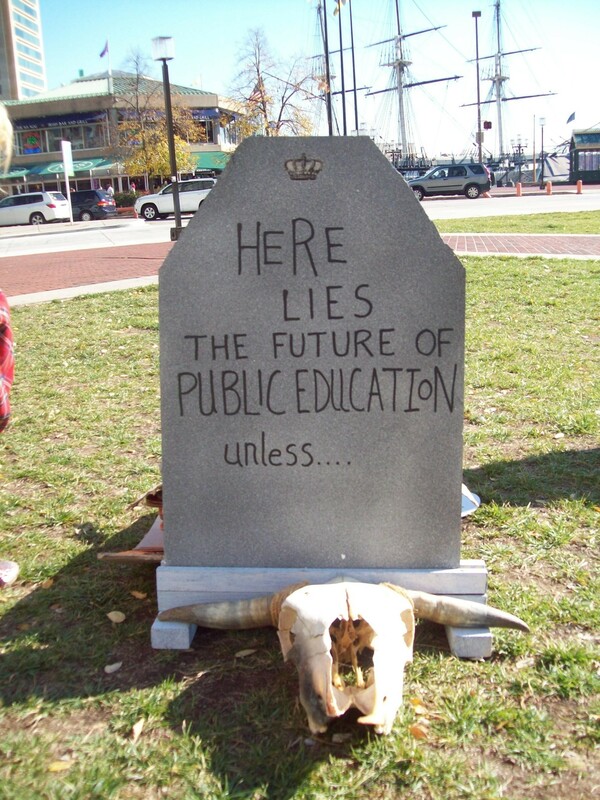 “Fast Tracking” the Privatization of Public Education: Who’s in Favor? (Here’s a beginning roster of who favors it: Lamar, Arne, Pearson, Apollo Inc, the National Governors Association, ALEC, and the Brookings Institute). I’d like to provide you with more details but I can’t because the negotiations are being made in a basement room of the Capitol and members are required not to disclose any information to anyone including the media. This is a secret negotiation with global ramifications. How does TPP work? For starters, “500 corporations and banks sit on advisory committees with access to various chapters.” ALEC has crafted model legislation asking legislators to “fast track” TPP, see here. We have indeed gone down the rabbit hole when ALEC and President Obama want the same thing. And educators fighting against corporate reform and privatization of our democratic institution (formerly known as public education) should be worried. Because this has everything to do with the privatization of education. ALEC’s interest in fast tracking TPP is motivating for them on every front and across every industry … and education is not excluded. ALEC model legislation pushes for more privately owned charter schools and online education on an international scale, financing privately run companies like K12 Inc and Connections Academy (both leading ALEC members), and Pearson– all of whom are developing online education models to deliver on an international scale. Lamar Alexander who is currently crafting his own revisions to ESEA (aka NCLB) policies in tandem with Dem Patty Murray, aims to decrease federal oversight of testing and curriculum, bringing these back into the hands of the states. I am all for de-clawing the federal government from dictating education policy and the elimination of federally mandated standardized testing. And yet, given how easily state senators, congressmen, governors, and policy–makers can be bought and sold by the corporate interests who fund their political campaigns, I wonder whether or not Alexander knew how easily his reforms would fit within the TPP framework. Alexander has been a supporter of the expansion of charter schools and privatizing public education, all the while promoting fewer tests and state level control. Such contradictions give me pause for concern. See Senator Alexander’s views on School Choice in his own words here. Alexander supports the effort to fast track TPP (fast tracking would make it nearly impossible to renegotiate or alter once it’s in place). Apollo Education Group has also provided political funding to Lamar Alexander over the years. I am sure their economic interests will be well served by their investment in shaping his policies. Online education corporations are international in scope. New state level reforms could easily fold business contracts to deliver classroom instruction, curriculum, and state level tests via these corporations. Achieve Inc promoted an event in their 2010 monthly newsletter highlighting Sir Michael Barber (CEO at Pearson) and Michael Fullan who co-chaired an international education summit in Toronto, Canada “designed to stimulate ideas, invoke creativity and foster innovation” called The Building Blocks for Education: Whole System Reform. This international summit examined four key areas: standards and targets; assessments and use of data; capacity building and the development of the teaching profession; and, leadership development and sustainability. Indeed, with TPP these multinational education industries which Alexander, ALEC and other corporate reformers endorse will have a fast track toward global privatization of public education. Maybe they’ve got an insiders view into those secret basement meetings that we don’t have. And our national public education system can be easily outsourced. These statements were spoken at a school-closing meeting about Langston Hughes Elementary School. The school is slated for closure by 2015. The community is fighting back to keep their public school. Langston Hughes Action Committee, a neighborhood group, has appealed the school board’s decision. So let’s back track to see how we got were. Langston Hughes Elementary is the best performing school in Park Heights (a Baltimore City neighborhood). It has the highest academic achievement rating of all the neighboring schools. The community loves this school. They see it as a corner stone of their neighborhood. It has a sound and well maintained infrastructure including a full size cafeteria and a playground. Generations of community members have attended this school. For the last ten years Langston Hughes has been home to approximately 220 students grades k-5. What Will Happen to the Children if They Close the School? The school they want to send them to is a lower performing one in neighboring Pimlico Elementary Middle School which was built in 1910 and has problems with overcrowded classrooms, lead paint and asbestos. Pimlico is scheduled for the first round of renovations under the 21st Century Schools Plan. This move means that even more neighborhood students would endure several years of lead and asbestos abatement and renovations. Children as young as six or seven would have to walk about one mile to Pimlico through a high crime, high drug, and high traffic area to get to school every day. Then once they’re at school, they’ll spend every day exposed to toxic chemicals that will create permanent developmental and health problems. Pimlico has lost over 100 students in the last few years—Langston Hughes is in better condition than Pimlico and has a better reputation. When the school commissioners accepted a challenge to visit the school, many didn’t even know where the school was. The school board members do not reflect the demographic of the community. They were surprised at how well kept it was. They declined to take the walk from Langston Hughes to Pimlico. Despite a positive impression, they voted for closure anyway. School system representatives have also stated they have no need to talk to parents. They have any right to close any school they want without talking to anyone. There is a $1.1 billion school construction budget for Baltimore city schools. Part of this budget includes mandated closure of 26 schools. As a result, communities are pitted against each other to save their schools. The Langston Hughes building is the only school in the major redevelopment area. It’s pretty clear to members of the Park Heights neighborhood that the plan for this community is gentrification—it starts with school closings. The school is clearly on a list of schools that charters are allowed to move into, which seems to be contrary to what Dr. Thornton told Helen Atkinson of the Teachers Democracy Project at a board meeting. Leaders of the Park Heights community have been informed verbally and by email that a charter school would like to use the building. Enrollment in 2013 was 217 students. Projected enrollment for 2013-14 was 229 students, but only 156 students signed up, according to school documents.However, according to community members, “as soon as the people found out the school wasn’t closing enrollment went back up.” Additionally, its kindergarten is currently at capacity. This announcement of this closing happened at the end of last school year making it difficult for the school to organize any kind of response. There are 38 charter schools in Baltimore city right now and there is a push from Governor Hogan to increase this number. Hogan believes that expanding charter schools is “a great idea.” I am unsure how that could possibly be the case for Park Heights. Unless of course you are a developer. This is strategically planned. To ensure that Langston Hughes closure could be “justified” they took the school’s budget away immediately—starting to dismantle the school. Even if the community wins the appeal it will be a hard slog to get the staff back in place and to recoup the loss of equipment and materials already removed. The community can demand the school go back to its previous status. The judge will decide to 1. Dismiss the appeal (in which case the city can proceed with closure) 2. Send the appeal to trial. What Can We Do to Save Langston Hughes? A school board meeting was held on May 12th to protest against the closure. This past week, the Administrative Law Judge ruled in our favor in the appeal against school board and proposed closing of LANGSTON HUGHES Elementary school. A trial is set for June 20 at 9:30 am. Continue to call 410-396-8803 to say Don’t close LANGSTON HUGHES call 24/7 you don’t have to leave your name. Join us on a walk on May 15th and again on May 20th from Langston Hughes to Pimlico Elementary Middle and see for yourself what we are expecting our children to walk through. The appeal regarding whether to send this case to trial will be decided on May 12th. Baltimore Algebra Project advocates for community control of schools. We need to protest we are not accepting these results. The Teachers’ Democracy Project, the Baltimore NAACP and Maryland Refuse are also in support of future actions including public protest in collaboration with community leaders. Join the Langston Hughes Community Action Facebook site. Advocates plan to protest whether or not the judge weighs in our favor in order to bring continuous pressure until the school is returned to community control. There’s a saying in certain addiction recovery circles that “One drink is too many and a million is not enough”—this phrase suggests that once an alcoholic takes the first drink there’s no guarantee they can control how many more they will take after that, or what will happen. I suggest that one of the reasons we are still so enmeshed with a test-driven reform mentality in spite of all the data and research documenting its destructive nature, is because we have a societal addiction of sorts to a test-driven dependency. One test is too many and a million will never be enough. While this might sound outlandish on the face of it, the similarities are so many this suggestion warrants our consideration. Rhetoric around the supposition that standardized testing is necessary to defend a social justice approach to remediating inequities within our public education system is currently being defended by certain leaders within some civil rights organizations. Why? As a statement by Jesse Hagopian and echoed by a press release by United Opt Out have made painfully clear standardized testing is the problem which disguises itself as the solution. It is not enough to call for “better” standardized tests or “limited” standardized testing, because either proposal implicitly endorses the blind faith that standardized testing itself measures anything other than a child’s access to economic or racial privilege, or access to the resources handed to the dominant class and denied to children living in poverty (largely children of color). The definition of insanity is doing the same thing over and over again, and expecting different results. We have had several decades of test-driven accountability in the name of equity and fairness. It has not worked, and it will not. Ever. Our societal obsession with standardized testing parallels an addiction mentality in that it perpetuates similar patterns of denial (the hallmark of addictive thinking): 1) denial –that poverty does matter, 2) denial– that the standardized tests themselves are the problem, and 3) denial– of our inability to limit or control the amount of testing that will occur. The parallel corollary is to that of an alcoholic who keeps saying “I can control it” or “I’ll just have one or two” when the outcome is always the same. The need for more. The reauthorization of ESEA is underway promising the potential reduction in standardized testing, to be controlled at the state (rather than federal) level. Bear in mind that the new Alexander and Murray ESEA bill “Every Child Achieves Act” leaves “the details regarding the mandated tests up to the states” (Scheinder) which means that, “States will also be permitted to include other measures of student and school performance in their accountability systems in order to provide teachers, parents, and other stakeholders with a more accurate determination of school performance.” Do you really believe they’ll just “stop at one” (aka grade span) or keep it “under control” (no stakes)? There will always be the distorted justification for “just a few more.” Billions of dollars of profits to the testing companies who wield lobbying and political control over state level policy makers have too much to gain. We are addicted to the greed, and social control that are manifest in the implementation of these tests. The attraction for them is just too great to say no. Once you start it’s hard to stop. We cling to an ideology of schooling driven by competition, sorting, tracking, and measuring that depends on standardized testing to “feed the need”. To illustrate this point further I feel the need to point out the parallels in addictive thinking between someone who says, “Well, you would drink too if you had my problems” while ignoring that fact that most of those problems are created by the excessive drinking– and a society that insists, “Well, you would need standardized testing too if you had our educational inequities” while ignoring the fact that those inequities are exacerbated by the testing itself. One of the ways in which someone struggling with an addiction attempts to “manage” their problem is by switching things up: from vodka to wine, drinking at home rather than bars, being sure to eat before going out. However, the results for the problem drinker are always the same. Likewise, as a standardized test obsessed society, we cling to the idea that if we can just switch to “better” standardized tests, or from federally mandated to state-mandated, that somehow therein lies the “miracle” solution. The results, again, will be the same. “Half measures will avail us nothing.” We should instead demand a revolutionary way of creating equitable, democratic, and meaningful public schools that serve all children. Until any reliance on standardized testing to shape how, who, or what we teach is eliminated, the possibilities for this revolutionary change remains daunting. By its very existence (even in reduced capacity), it will remain the focal point, the “True North” that drives how/what we teach, how we define children’s success, and how we perceive teacher quality. As a test addicted society we cannot imagine public schools without standardized testing any more than an active alcoholic can imagine life without booze. We cannot imagine life with them, or without them it seems. But it is possible. In fact, in spite the amazing evidence for success of these programs, and the love expressed by students in these program FOR these programs (….ever seen students FIGHT to keep standardized testing?) two of the three of them were roundly dismantled. The Ethnic Studies Program in Tucson AZ showed a tremendous growth in graduation and college acceptance rates for the youth in that program (largely Latino/a students). They felt empowered. They began to love learning. They had hope. What happened? The state of Arizona deemed the program illegal and banned it. While it was later reinstated in some form, they continuously face attacks from the AZ Dept of Education and state legislators attempting to silence and control their every action. Baltimore Algebra Project, a student-led tutoring program continues to serve students in ways that truly maximize their wisdom, strengths and needs. Their “mission is to carve a community of leaders as well as exhibit leadership while remaining committed to the education of those in need of advancements in their socioeconomic status.” Name me a test that has EVER proven to do this successfully. Why is this not a model being grown to “scale” rather than desperately trying to build “better” tests? It would be a powerful movement if the same civil rights leaders who so vigorously defend standardized testing in the name of equal opportunity for students of color in public education put forth even half the attention to lobbying for these programs and the creation of more like them, as they do in fighting to defend standardized testing. Why are we not spending time, media attention, and money growing the movement for democratic and equitable schools from the foundation of programs that have proven to make a difference? In other words: The only way to get equality in education is to demand equality through our actions. Tests do not create equality. PEOPLE DO. It would be a revolutionary redirection of resources and attention (now squandered on testing development, implementation, and data collection) that would yield the results they (and so many more of us) wish to see for under-served and under-represented students and their public schools. Baltimore City is on the nation’s radar right now. Yet beside the media such as CNN running 24-7 news casts, who you don’t see working behind the scenes are the charter school privatizers. They were here before Freddie Grey was a national headline for police brutality. With Governor Hogan taking the lead, charter school proponents (profiteers) have been wielding revised charter school laws. And now…as Baltimore struggles to seek justice and to empower their community Voice, new charter laws are “sweeping up” from behind ensuring that public education be demolished. The voices from the city’s youth cry for relevancy, equity, and opportunity and cities like Phillie, Detroit, NOLA, New York and Chicago reveal that advancing charters will FAIL these children. They will FAIL these communities. The voices of the youth, seen and heard all over the world these many past few days illustrate the FAILURE of current education reform policies to meet the needs of Baltimore’s youth. Instead of after-school programs and fully funded rich curriculum and reasonable class size and human services, we feed them more tests and bogus “career and college ready” materials that serve no one but the testing and publishing companies. And the “solution” (according to private companies and politicians in the back pockets of said corporations) to their anger, needs, and desires is to dismantle their schools and communities, replaced with for-profit privately run charter schools. 1. The effort to keep Langston Hughes Elementary open rather than turn the building over to a charter school and send the current students to Pimlico. 2. The charter coalition board is arguing behind the scenes for an increase to their already large per pupil. They want $10,010 next school year which is an increase of about $600 per pupil over their current rate. If they are successful in persuading the board about this, it will impact the budgets for all the other schools and may even force further layoffs. One of my big concerns is that, among other things, public assets including valuable land and school facilities are being “relinquished” as district school enrollments drop – often these days because district officials themselves are forcibly closing their schools and handing them over to charter operators – or, sending out pamphlets to parents telling them that the charter schools are better, so choose them, not us. In many cases, citywide enrollments are remaining relatively constant. That is, the number of children that need to be served isn’t changing. Children are being shifted from district schools to charter schools. District facilities (land and buildings representing the investment of taxpayers over decades) are being sold at bargain rates, and there’s no turning back. Many urban districts now lack the capital assets to serve the children they would be responsible for serving, were the charter sector to suddenly collapse. For a full run down of how new charter laws will affect Baltimore City (and Maryland state) public school students read here: “Explanation Behind the Proposed Charter School Legislation“.